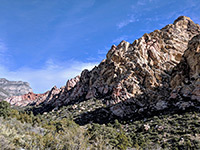 The 6.2 mile White Rock Loop is one of the longest of the many trails in Red Rock Canyon National Conservation Area; a circuit all the way around the White Rock Hills, a sizeable detached block of Aztec sandstone separated by Red Rock Wash from the main exposures to the south. 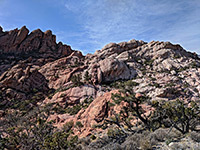 As its name suggests, most of the rocks are white though the underlying red layer is exposed in a few places, especially around the northern tip, where the trail reaches its highpoint, just over a thousand feet above the lowest section, the Mojave Desert flats to the south. 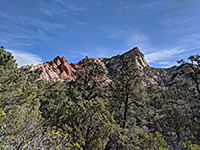 On account of this relatively large elevation change, the vegetation along the loop is unusually varied, from yucca and cacti in the desert areas, to tall pines and large shrubs around the northern saddle. The views are consistently good, all the way, and the trail is fairly popular, being well maintained and easy to follow. Potential side trips include to the cascades of Waterfall Canyon (another 1.5 miles, one way) and the relics near La Madre Spring (another 0.7 miles). The White Rock hike is served by two trailheads - the busy Willow Spring picnic area on the southwest side of the hills, at the end of a paved spur off the scenic loop, and a quieter parking area at the end of an unpaved spur at the east edge of the hills. The loop is equally suitable for hiking in either direction; described below is the anticlockwise walk from the eastern (White Rock) trailhead. 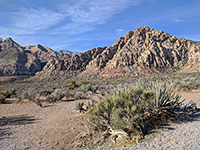 The stony, half mile spur road to the White Rock trailhead climbs gently over flattish land sparsely covered by small bushes, and ends at a parking area with space for about two dozen vehicles, just a few feet from white rocks at the edge of the hills, and beside a wide, usually dry streambed that originates in the higher slopes of the La Madre range a few miles north. One other trail starts here, a 1.1 mile route to rocks along the Keystone Thrust. The northwards loop path crosses the wash while climbing steadily though not too steeply, soon moving back to the west side of the drainage where the gradient increases somewhat, and the mostly bush-covered rocks at the base of the hills are replaced by unvegetated exposures of red and white. 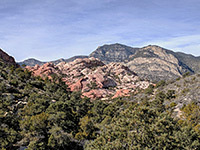 Around the high point - a saddle at 5,482 feet - the path runs through a patch of tall pinyon pines, as the view changes, from the extensive open land that extends eastwards towards Turtlehead Peak, to the more enclosed upper reaches of Red Rock Wash, which runs below the north edge of the hills. Ahead, the land slopes down gradually and remains shady and well vegetated, quite moist at some times of the year - a good location for birdwatching, and the scenery is similar for most of the way down to the far side of the hills. 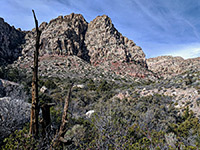 The path eventually moves away from Red Rock Wash into more exposed terrain and meets an old roadbed, which to the right forms the trail up to La Madre Spring. In the other direction, the track continues southwestwards and in half a mile meets Rocky Gap Road, a 4WD route that leads back to the Willow Spring trailhead, the alternative start point for the loop. From here, the southern segment leaves the paved access road just south of the picnic area, close to some petroglyphs and the site of an agave roasting pit, follows the edge of the hills then runs along a little ridge, before descending slightly into a minor wash. Next is a crossing of a larger drainage, followed by a traverse of a desert plain, rising gently while heading northeast back to the start point. Just before the end is a short side trail to White Rock Spring, a bush-lined pool.